For the first time ever!!! 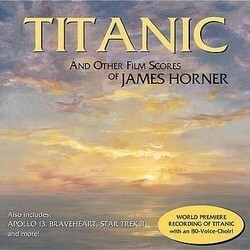 TITANIC has been recorded with a 90-piece orchestra and an 80-voice choir! TITANIC is now the biggest and most successful motion picture in film history. The original soundtrack recording (with worldwide sales of over 20 million copies) used an orchestra of studio musicians and a synthesizer in place of a real choir. Now, sounding bigger, lusher and more beautiful than ever before, TITANIC has been recorded with the 90-piece Royal Scottish National Orchestra and their 80-voice choir! The epic and glorious sound is truly breathtaking. You haven't heard TITANIC until you've heard this TITANIC.